Henry Ford (July 30, 1863 – April 7, 1947) was the founder of the Ford Motor Company and is credited with contributing to the creation of a middle class in American society. He was one of the first to apply assembly line manufacturing to the mass production of affordable automobiles. This achievement not only revolutionized industrial production in the United States and the rest of the world, but also had such tremendous influence over modern culture that many social theorists identify this phase of economic and social history as "Fordism." Racing was, by 1913, no longer necessary from a publicity standpoint because the Model T was already famous and ubiquitous on American roads. It was in this year that Henry Ford introduced the moving assembly belts into his plants, which enabled an enormous increase in production. Although Ford is often credited with the idea, contemporary sources indicate that the concept and its development came from employees Clarence Avery, P.E. "Ed" Martin, Charles E. Sorensen, and C.H. Wills. On January 1, 1919, after unsuccessfully seeking a seat in the United States Senate, Henry Ford turned the presidency of Ford Motor Company over to his son Edsel, although still maintaining a firm hand in its management—few company decisions under Edsel's presidency were made without approval by Henry, and those few that were, Henry often reversed. Also at this time, Henry and Edsel purchased all remaining stock from other investors, thus becoming sole owners of the company. The company remained privately held by the family until 1956, when the family allowed a public offering of a portion of the company without ceding control. In 1926, Ford instituted the five-day, forty-hour work-week, effectively inventing the modern weekend. In granting workers an extra day off, Ford ensured leisure time for the working class. The "short week," as Ford called it in a contemporary interview, was required so that the country could "absorb its production and stay prosperous." Henry Ford began publication of a newspaper, The Dearborn Independent, in 1919. The paper ran for eight years, during which it republished "Protocols of the Learned Elders of Zion," which has since been discredited by virtually all historians as a forgery. The American Jewish Historical Society describes the ideas presented in it as "anti-immigrant, anti-labor, anti-liquor, and anti-Semitic". The Independent also published, in Ford's name, several anti-Jewish articles which were released in the early 1920s as a set of four bound volumes, cumulatively titled "The International Jew, the World's Foremost Problem." These volumes were distributed through Ford's car dealerships. Denounced by the Anti-Defamation League (ADL), the articles nevertheless explicitly condemned pogroms and violence against Jews (Volume 4, Chapter 80), preferring to blame incidents of mass violence on the Jews themselves. None of this work was actually penned by Ford, though they required his tacit approval since he was the paper's publisher. Lawsuits in response to anti-Semitic remarks led Ford to close the Dearborn Independent in December 1927. He later retracted the International Jew and the Protocols. On January 7, 1942, Henry Ford wrote a public letter to the ADL denouncing hatred against the Jews and expressing his hope that anti-Jewish hatred would cease for all time. Some claim that Ford neither wrote nor signed this letter and have questioned the sincerity of his apology. His writings continue to be used as propaganda by various groups, often appearing on anti-Semitic and neo-Nazi websites. Ford became interested in politics and as a successful and powerful business leader, was sometimes a participant in world affairs. In 1915, he funded a trip to Europe, where World War I was raging, for himself and about 170 others. His group went to meet with German and other European leaders -- without U.S. government support or approval -- to seek peace. The war lasted another three years. 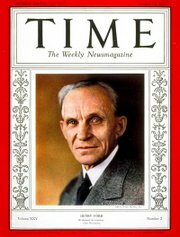 In the years between the wars, Henry Ford spent years bestowing gushing praise on Adolf Hitler's Nazi regime, although this praise abated as the United States entered WWII. There is also some evidence that Henry Ford gave Adolf Hitler direct financial backing when Hitler was first starting out in politics. This can in part be traced to statements from Kurt Ludecke, Germany's representative to the U.S. in the 1920s, and Winifred Wagner, daughter-in-law of Richard Wagner, who said they requested funds from Ford to aid the National Socialist movement in Germany. However, a 1933 Congressional investigation into the matter was unable to substantiate whether contributions were actually sent. Regardless of whether direct financial support was provided, Ford repeatedly voiced his overt approval of Hitler's theories. Ford had an interest in what today would be known as "Americana". In the 1920s, Ford began work to turn Sudbury, Massachusetts into an Americana-themed historical village. He moved the schoolhouse from the Mary had a little lamb nursery rhyme from Sterling, Massachusetts and purchased the historical Wayside Inn. This plan never saw fruition, but Ford repeated it with the creation of Greenfield Village in Dearborn, Michigan. It may have inspired the creation of Old Sturbridge Village as well. About the same time, he began collecting materials for his museum, which had a theme of practical technology. It was opened in 1929 as the Edison Institute and, although greatly modernized, remains open today. Ford also had an interest in American folk music, which he shared with his friend Dr. Lloyd Shaw, and frequently sponsored square dances, one of his particular interests. Ford was an early promoter of aviation, building the Dearborn Inn as the first airport hotel. (The airfield was across the street and is now the site of a Ford Motor Company test track.) He heavily sponsored the Stout Metal Airplane Company, which developed the Ford Tri-Motor, an early airliner. Ford also maintained a vacation residence (known as the "Ford Plantation") in Richmond Hill, Georgia. He contributed substantially to the community, building a chapel and schoolhouse and employing a large number of local residents. His knowledge of the Ontario town of the same name is believed to have led to the renaming of the Georgia town, formerly known as Ways Station. Henry Ford, with his son Edsel, founded the Ford Foundation in 1936 as a local philanthropic organization with a broad charter to promote human welfare. The Foundation has grown immensely and, by 1950, had become national and international in scope. The foundation no longer has any association with the Ford Motor Company, nor with the family or descendants of Henry Ford.